Plans for an adaptation of the hit video game Bioshock fell apart back in 2011, and now Irrational Games doesn't want to force a movie unless it's going to be done right. Therefore, Bioshock is nothing but a pipe dream for fans wanting to see the story play out on the big screen. However, you can imagine what the film might have looked like as some concept art from illustrator Kasra Farahani (Star Trek Into Darkness, Thor) has surfaced online from Blastr (via SlashFilm). It doesn't give us a much better idea of what the movie would look like beyond the aesthetic we've already seen in the game, but it's some nice work. Look! You can still check out an awesome fanmade teaser trailer for a Bioshock movie right here. 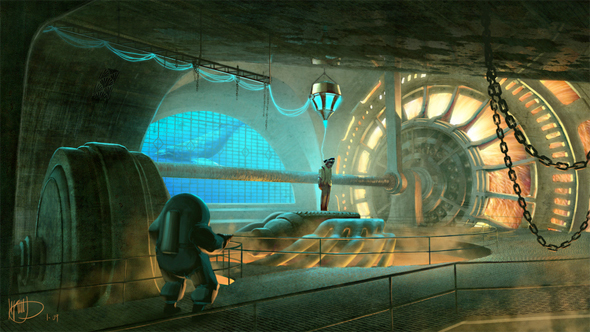 Of course, this is just what one artist turned in for concept art for the film. Studios commission many artists to design various aspects of films, but they don't all end up becoming realities on the big screen. There's a lot of Star Wars: Episode VII concept art out there featuring things that aren't in the movie, and were merely created as pitches of potential characters, sets, weapons, etc. to put in the film. As you can see, some of the locations have bee adjusted to remove the overwhelming presence of the underwater elements of the video game. Someday we might get a Bioshock movie, but not soon. You still want a Bioshock movie?